Identifying the causes of procrastination is the first step in overcoming procrastination. 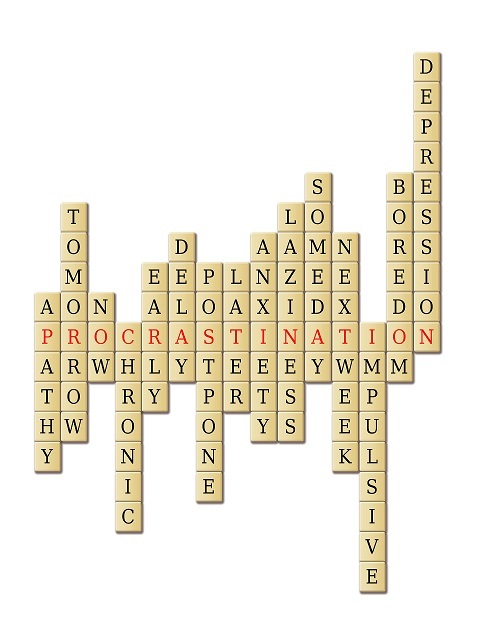 Here I look at 7 reasons why people procrastinate and solutions to overcome procrastination. addicted to the adrenaline of the last minute rush. Here I talk about these 7 causes of procrastination and what you can do about it. Do you find that you put unpleasant tasks off? What could be easier than having that difficult chat with an employee or writing that tedious report? Avoiding unpleasant tasks is one of the biggest reasons why people procrastinate. Here are a number of steps on how to overcome procrastination when putting off unpleasant tasks. Do you put a lot of pressure on yourself to do tasks to a high standard? Often perfectionism or very high standards can create unrealistic expectations. Common statements such as "I must not fail" or "I have to do this perfectly" may paralyze you. Unrealistic expectations meant he likelihood of disapproval or the fear of failure. Overcome this fear of failure and get things done. This could be anger or resentment towards the requester or the establishment. People may harbor hostility and since it is not acceptable to vent their frustration or anger, they may choose to withhold their effort. Each person procrastinates for different reasons. Thus dealing with procrastination effectively is about tailoring a unique solution for you. 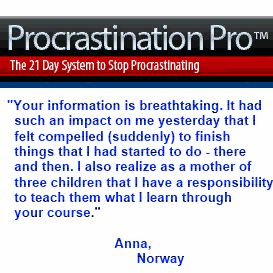 In this 21 day procrastination course my causes of procrastination were identified, the typical excuses I made, and I got lots of effective procrastination strategies that got to the heart of my procrastination. Click Here! A common cause of procrastination is facing a gargantuan task and feeling overwhelmed. To confront this gargantuan task it is important to adopt the strategy of any good project manager and to break these tasks into smaller milestones. Here I provide a procrastination template to break your tasks into mini-tasks so that you don't feel so confronted. A lack of goals are the weeds that strangle and uproot motivation. Clear goals that are meaningful and desirable to you are the spark that ignites your motivation and passion. Setting clear personal goals or career goals blows procrastination out of the water. With email, internet, and the latest gadgets on the cell phone, it is easy to be distracted. Tasks can fall by the wayside as people are distracted from their priorities. These procrastination strategies create a sense of urgency - the exact opposite of procrastination. Do you think you do your best work under a tight deadline? Do you find it hard to motivate yourself when you have plenty of time to do the activity? Are you addicted to the adrenaline of the last minute? Many people think they work best under pressure. While that may be the case some times, over the long term there have been numerous studies that chronic pressure and stress lead to exhaustion and poorer work output. Is it time to kick your procrastination habit? Alternatively try this 21 day system to stop procrastination. After doing this 21 day course I understood my unique procrastination habits and was able to apply effective strategies to get things done. If you liked these causes of procrastination then you will also like why do people procrastinate.